Mobile City Hall is located at 216 East Pritchard Avenue, Mobile, AL 36610; phone: 251-208-7576. 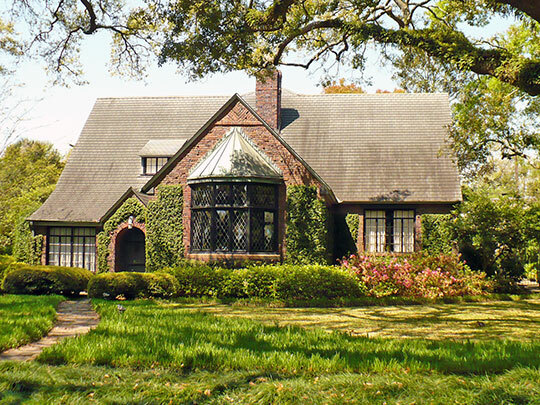 Photo: Home at 109 Lanier Avenue, Ashland Place Historic District, Mobile, Al. The Historic District was listed on the National Register of Historic Places in 1987. Photographed by User:Altairisfar (own work), 2008, [cc0-by-1.0 (creativecommons.org/publicdomain/zero/1.0/deed.en], via Wikimedia Commons, accessed December, 2013. Spanish explorer Alonzo Alvarez Pineda first explored the area that would become Mobile in 1519 during a voyage on which he charted much of the Gulf of Mexico. Pineda met with local Indian groups in the interior along the Mobile River. Two decades later, Hernando de Soto, traveled to the area in search for gold. Unlike Pineda, de Soto's encounters with local Indian peoples were violent and many Spanish troops and Indians were killed. In 1559, a final Spanish explorer, Tristan de Luna, established a short-lived settlement near Mobile. After a hurricane devastated the expedition, the Spanish government abandoned its search for gold in the area. It would be another century before a European country explored the lower Gulf Coast. The City of Mobile is the county seat. Both the city and the county derive their name from Fort Louis de la Mobile, a French fortification erected near Mount Vernon in 1702. Mobile was moved downriver to its present location in 1711. The word Mobile is believed to come from a Choctaw Indian word for "paddlers." The area was occupied by the French from 1702-1763, by the British from 1763-1780, and by the Spanish from 1780-1813. Courthouse fires occurred in 1823, 1840, and 1872. Alabama Humanities Foundation, Auburn University, Encyclopedia of Alabama: Mobile, www.encyclopediaofalabama.org, accessed December, 2013. Alabama Department of Archives and History, Alabama Counties: Mobile County, www.archives.state.al.us, accessed December, 2013.